Physiotherapists play a vital role in supporting people with Parkinson’s Disease to choose management strategies, prioritise and address the challenges they face over the course of the condition. Improving movement and safety is usually the main focus of physiotherapy in light of the progressive pathology and the disability and participation restrictions this can cause. The American Academy of Neurology recommend the clinicians discuss the clinical presentations of the individual with Parkinson’s at least once yearly with a physiotherapist to consider when would be an optimal time to refer the person for physiotherapy services. An ideal best practice standard would be for the physiotherapist to have Parkinson’s expertise, and to be involved at the point of diagnosis. This does not always occur and until such time as we are referred all people with Parkinson’s, some referral criteria have been agreed. Physiotherapy assessment considers ways in which the condition is affecting the individual with Parkinson’s, whilst being aware of the impact on close carers and relatives, especially when someone is newly diagnosed or has been diagnosed for some time. It is known that people with Parkinson’s are less active than their peers as the condition progresses, resulting in muscle weakness and power, increased falls risk and reduced walking speed, itself an indication of reduced life expectancy. Balance impairment and falls are a common problems for people with Parkinson’s; these problems often start after about 5 years of diagnosis due to worsening of the systems that maintain body position, the progressive slowness of movement, of trunk rigidity and reduced proprioception. Balance often becomes worse when motor and mental tasks are combined (dual/multi tasking). Falling has wide ranging impact including carer stress and fear of movement. 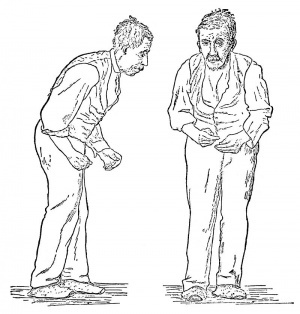 People with Parkinson's Disease require assessment of continuous or episodic problems with gait. As the condition progresses, the individual’s needs, and our physiotherapy goals will alter; it is essential that the person is reviewed regularly. In the early stages of the condition, physiotherapy assessment should aim to support educational needs e.g. about keeping fit, active and healthy, and on minimising the impact Parkinson’s on people’s lives. As Parkinson’s progresses and the individual experiences problems with their movement, the assessment focus moves towards a review of physical activity and mobility, possibly assessing for the optimal movement and cognitive strategies. In the later stages, as the condition progresses, many of the symptoms of Parkinson’s have a bigger impact on daily life, often mixing with other medical conditions. Physiotherapy assessment focuses on decisions about how to cope with these changes with an emphasis on a support network to best keep the person active and safe when moving. Other issues physiotherapists should assess for are pain and respiratory problems. In terms of an easy access on-line resource, we advise to you to read the Review version of the European Physiotherapy Guideline for Parkinson’s Disease. Although the title intimates ‘European’, the evidence informing the document is taken from international studies and input from worldwide experts. The Guideline is an update of the first evidence-based guideline with practice recommendations for physiotherapy in Parkinsons’s was published by the Royal Dutch society for Physical Therapy (KNGF), the ‘Dutch Guidelines’.. The Association of Physiotherapists in Parkinson's Europe (APPDE) requested the update, the KNGF agreed with ParkinsonNet (a community of healthcare professionals specialised in Parkinson's) to update and adapt the guideline into a European guideline for physiotherapy in Parkinson’s. The development is endorsed by the APPDE, the European Region of the World Confederation for Physical Therapy (ER-WCPT) the European Parkinson’s Disease Association (EPDA). Nineteen member organisations of the ER-WCPT, as well as people with Parkinson’s and their representatives participated in the development process of the European Guideline. The classification system of the International Classification of Functioning, Disability and Health (ICF classification) is used. This framework provides a common language and basis for understanding and describing health and health-related problems. The aim of using this common language is to improve communication about functioning of individuals with Parkinson’s between health and social care workers, researchers and social policy makers. Appendix 4 on page 103 provides an ICF assessment and report form; Appendix 9 on page 155 provides a list of Parkinson’s-related ICF domains, and Appendix 10 on page 156 provides the most appropriate measurement tools validated with Parkinson’s populations according to the ICF domains. Understanding the impact of medication on both the movement and thought quality of people with Parkinson’s will help set goals and plans for physiotherapy intervention. Individual Parkinson’s Associations provide country-specific information about medications prescribed. E.g. In the UK, where physiotherapists can train to prescribe medication, a good summary of drug therapies can be found on the Parkinson’s UK site and in the US, the National Parkinson’s Foundation provides advice.